I did get to go out last Tuesday night. I met up my friends here Michael and Jim (who just came from the Chumley's Cruise) and some new friends, David, Roger, Steve, and Wayne. 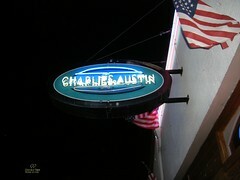 We went to Charlie's Austin. It's a very nice bar. They served steaks for 6 bucks! I like Austin a lot. The Chain Drive was sort of blah last Sunday night when I arrived. I wanted to see where Bears on the Run took place. Over all, my Austin visit was a good one. I'd like to go back again.